Go Mobile! Print photos and documents using a smartphone, tablet, or mobile computer from your home, office, or from around the world. Print photos and documents from virtually anywhere. Email your files to a unique email address an EPSON printer for automatic printing. It supports almost all email-enabled device. Print or scan your photos, documents and web pages from your smartphone or tablet. Print and share your files using the Box, Dropbox, Evernote, Google Drive or Microsoft onedrive. Available free from the App Store or Google Play. 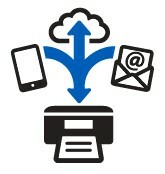 Using Epson printer to scan your file and upload it to an online storage or account "Cloud". Supports Box, Dropbox, Evernote, Google Drive or Microsoft onedrive of Epson iPrint Mobile App or directly from the printer control panel. Print outside the home or office network using a laptop or PC. You can print from any application to a compatible Epson printer anywhere. It's as easy as File> Print. 0 Response to "Epson Connect"